Looks like a familiar place but not sure where it is. I think this is Rugby. The background loco is maybe a Crab 2-6-0, but difficult to be sure. Yes, definitely Rugby, east (Up) end of the station. Whatever that object in the background is, it doesn’t look like a Crab to me. Date? Obviously 1927 — 1938, and from the engine’s livery (LMS on tank side) probably towards the end of that period. This locomotive was LNWR 1551, renumbered LMS 6826 in ?? Taken from files LOCO189 and NOTE282 in the LNWRS Archive, also J W P Rowledge in “Locomotives Illustrated 147”. As far as I can see, it doesn‘t seem to have a smokebox door shedplate, so must be before 1935. In that case I would suggest Rugby around 1932/35 rather than 1936/38. Do you agree Harry? 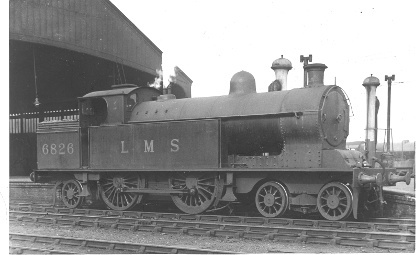 From the LMS Stock Alterations ex—LNWR No 1551 was renumbered 6826 in the period 7.11.1927 — 4.12.1927 and it was condemned in 27.11.1938 — 31.12.1938. The smokebox shedplate seems clear, and looks like the 1935 cast—iron type, so the date of the photo would be 1935—8. When the engine was given its LMS number in Nov/Dec 1927, ‘6826’ would have been painted in large numerals on the side of the tank. By the time of the photograph it had been repainted with ‘LMS’ on the tankside. I don’t know how many years would normally have elapsed between repaints on the LMS (can anyone tell us?) but dating this photograph to 1935 or later seems reasonable to me. Yes, Harry is quite right, I can see the shedplate now. Perhaps I need new glasses?